How this little bar of loveliness will help you eat less. Konjac (glucomannan) is a root vegetable which helps with weight loss when used with an energy restricted diet. Our chef spent years perfecting our own secret konjac recipe which works brilliantly with 1g in every Slim-Be bar and shot. For weight loss, take 3 x 1g a day with 1-2 glasses of water before meals (advice supported by EFSA). 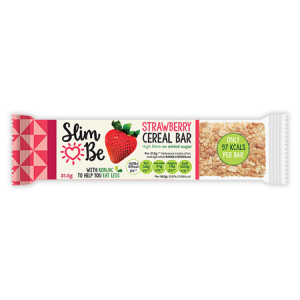 Our strawberry cereal bars contain 1g of konjac (glucomannan), a natural root extract which has an EFSA health claim, Slim-Be cereal bars can help you stay fuller for longer and therefore help you eat less. Typically cereal bars can contain up to 22g of sugar per bar. That can’t be good for you can it? 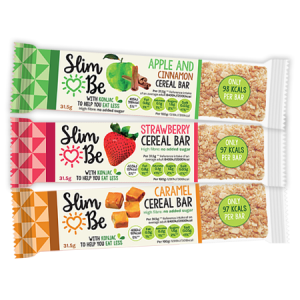 Our cereal bars are a healthy alternative with less than 1.7g of sugar and fewer than 100 calories per bar; 1% fat (and sat fat); 2% sugar, 1% salt. They are also high in fibre. Our recipe is simple. 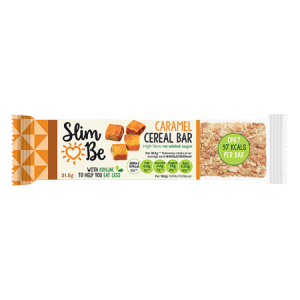 We use oats, wheat and barley, with a tiny amount of sweetener and our own flavour formulation to give you a delicious tasting cereal bar. You can enjoy it whether you are on a diet or not and best of all it isn’t full of sugar. Right now, they are the only cereal bars that are all green in the ‘traffic lights’ nutritional guide.